We’re still cooling our heels on the Island. The family meeting went off fairly well and the decision was to rent the parent’s house out for awhile. We did a major cleaning effort and have stored some items in the garage for the short term. Everyone was pretty pooped by the end of the day. One night sister Janet (and John) took Aileen and I out for supper at Deez in Qualicum. We had a great time; thanks guys! Another day, my brother in law John Randall, guided Aileen and I around the forest trails adjoining the Fanny Bay Nature Preserve. The old guy who owns the property has made trails and created “art and controversy” both on his property and the Preserve. He has cut into mature trees and inserted wooden books into the openings. Open the book and find a quote either from him or some famous person. He has also attached found objects such as water taps to the trees or used them in creating “art” objects. Apparently the Preserve took him to court but lost. These are not the types of things a logger or sawmill would want to see in the line of their work as it could be very dangerous to encounter. Presumably this whole area will never be logged so shouldn’t create any problems in the future. Robin’s sister Nancy (and husband Brian) stopped in on October 23 on their way to their B&B on Hornby Island. They had Georgia with them and wished to tour our trailer. We had a nice visit before they had to continue on to catch the ferry. On Friday the 24th Aileen and I picked Richard up at the bus depot in Nanaimo. On the Saturday morning we three went to the Buckley Bay ferry dock and met Brian and Nancy to retrieve Georgia from them. Georgia had a tray of Halloween baking that she and Nancy had done. From there we went to Cumberland. After a tour of the town, we had a nice lunch at a new little eatery; didn’t even have a name yet. Following that we visited Perry and Lynda Jessop. Their older son Matthew was Richard’s best friend in Chase and they spent many weekends at each other’s house. Matt joined us on several camping/fishing weekends over the years. We all visited them in the late 80’s in Port Edward, near Prince Rupert. Aileen and I visited them in 2004 just after the moving van departed from moving them into their Cumberland house. Perry’s comment at that time was “how the hell did you find us?” to which Aileen replied – the internet! It was great to see them again and they seemed pleased to see Richard and Georgia. We had to rush away from the Jessop’s to get back to Parksville for the big birthday party at Stanford Lodge in honour of my Dad’s 86th and John Hargrove’s 61st. We booked the family room and decided they hadn’t counted on our family when they built it. All 7 of my siblings and their spouses were there with some of the grandkids and 3 great grandkids making 38 total. I think if all the grandkids and their spouses had been there the total would have been about 69. We pre-ordered Chinese food and a large cake. The food, cake and ice cream came to $13 for the adults minus Mom and Dad so it was very reasonable. Dad was in pretty good shape luckily. He really enjoys his Chinese food and was very methodical and thorough with opening presents. Sheila used my camera and got a really good 4 generation picture of Mom and Dad, Richard, Georgia and me. Yesterday, Sunday the 26th, Aileen and I took Richard and Georgia home to Victoria. We drove past Aileen’s Mom’s old house in Parksville which has been renovated and is now for sale. We peeked in the windows and were amazed at the changes. Edna would have been very impressed, I’m sure. We also took Richard to see the bench the family installed overlooking the ocean to honour Edna’s memory. We then stopped by the Lodge to visit my parents again. Georgia left them each one of her Halloween cookies. The parents looked a little tired after the excitement of the party. Richard drove from Nanaimo which was a nice break for me. We had a tour up to the Cowichan River Provincial Park and also into Bamberton Provincial Park. Both campgrounds are not solar friendly as most of the sites are heavily forested. Very welcome shade for summer but not so good for longer term off season boondocking. Robin met us on the outskirts of Victoria at a nice restaurant for supper. Afterwards we transferred all R&G’s stuff and luggage into their van and Aileen and I headed homeward. Aileen drove to Duncan then I drove the rest of the way arriving home before 8:30. We moved down to Goldstream Park near Victoria on Friday (Oct 10) morning. All the sites are heavily wooded so no solar panel activity for the most part. We stayed four nights and the batteries were getting pretty low. We had to use the furnace extensively as it was cool and damp. RV furnaces are very greedy users of both power and propane but make the trailer very cozy in short order. We went into town to pick up Richard and Georgia on Saturday morning then returned to the trailer to have a bonfire for lunch. When Georgia heard about the fire, she hoped we were having marshmallows so we had to stop and buy a package along the way. After lunch we drove through Humpback Valley Road over to the West Coast highway and on to Jordan River. We were stopped at a RCMP/Conservation Officer check and when asked if we had any wildlife, Richard said only in the backseat. The CO looked in and saw Georgia and laughed; carry on! We stopped on the beach at Jordan River where there were clouds of seagulls. Just as we arrived they lifted off en masse which was one of those fabulous shots; of course my camera was still in the bag. We did stop at French Beach and spent some time enjoying the big waves. Unfortunately the weather deteriorated as the day progressed so the ocean was not photogenic. Robin ordered Chinese food which we picked up on the way back to R, R and G’s. On Sunday Aileen joined her friend Bev Denslow to hear Bev give the Thanksgiving service at her church. I wandered around the area (downtown) some both alone and with Mitzy but mostly too noisy and busy for her so she was happy to go back in the truck. After the service Bev joined Aileen and I for lunch at Bev’s favourite Chinese restaurant. After leaving Bev at her sister’s house in Oak Bay, we went to Cattle Point for awhile to get Aileen her ocean fix for the day. The weather was quite pleasant and we were entertained by some daring cyclists doing their hip hop jumps on the rocks and logs. One chap who was very good told us he’s been doing it professionally for eight years. 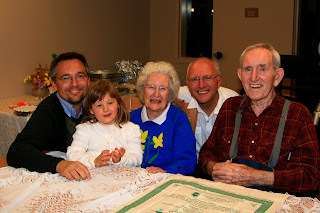 We went out to Sidney to Robin’s parents, Barbara and Allan, for turkey supper. Robin’s sister Nancy and husband Brian joined us for a delicious meal. Barbara had just set the last bowl of food on the table when the power went off. There were already candles lit on the table so Barbara lit a few more and supper continued. Bottom line, if you invite us to supper, expect the power to go out. The power did come on after a couple hours so coffee was then partaken. Aileen contributed a very tasty pumpkin pie that she made in our trailer oven last night. On Monday Aileen and I had Georgia for the day. After a visit to Bolen’s Books, Georgia’s favourite store, we took her to the trailer again for another weiner roast. It was a bit of a struggle to get heat out of the fire as it was raining fairly hard. Stayed under the awning except to run out and cook. Georgia thought that was okay. After being told many times to come out of the rain, Georgia was quick to turn the tables on Aileen when she ventured out idly. “Grandma, come out of the rain!” Later she and Grandma made peanut butter cookies while I went for a walk in the rain with my camera. I managed to come back with a boot full of water from slipping off some debris while I was crossing the creek. Supper was courtesy of R&R back at their house. Tuesday was “hit the road” day again. Every morning we’ve walked around the whole campground but for a change this morning we walked down the river trail from the top of the campground. It was very quiet in the campground today. On Saturday they had to open more sites as we filled right up. We had to visit the sani dump today on our way out so it was 11:30 before we were actually on the move. We stopped shortly for lunch at a rest stop on the Malahat with a nice view over Finlayson Arm. We traveled just over 50 kms today. We parked in my cousin Garry’s yard just north of Duncan which is very close to where I was raised. We wandered around the area, went for some walks and did some grocery shopping. I also found time to load the air card (for internet) and office programs onto Aileen’s new laptop so she is fully operational now. We bought her a cordless mouse today so no cord to fight with. Aileen cooked supper Tuesday night and we packed it over to the house. Barb did supper Wednesday night. We’d watched the election results Tuesday night and as the Province headlines said “$290,000,000 and no change”. We had planned to vote by mail but although I filled out the forms online weeks ago for the papers to be sent to Charlie’s, nothing ever showed up. I guess our two votes weren’t going to change anything as our MP took 52% of the vote, or something like that. We had planned to visit my cousin Dale Anderson but only got the voice mail when I called. That’s the third time we’ve tried recently. We packed up in light rain Thursday morning and headed for Parksville. We had heavy rain most of the way but it dried up about Nanoose and stayed dry til evening. We are once again set up in the parents’ yard in Errington as there is supposed to be a family meeting this weekend to try and decide what to do with Mom and Dad’s house. Some want to sell, others rent, so hopefully we can get past that and get to the point where the belongings can be disposed of. We’re all having difficulty with the whole idea since both parents are still alive and it all seems wrong. However, we can’t just leave everything as it is either since there is no way they can ever live on their own again. The house is not benefiting by sitting empty and there is so much that needs to be gotten rid of before selling or renting. We are so looking forward to getting off on our and heading south for the winter. We’re so spoiled and not used to all this family stuff and having to wait around for things to happen, I guess. Aileen and I were into the bank in Parksville doing more to settle her mother’s estate on Thursday and Friday. It was so simple compared to what my family is going to eventually experience with our parents. We do have a ferry reservation for November 2 on the Victoria-Port Angeles 10:40 sailing. Our plan is to wander down the coast well into California before heading east to Arizona. No real plans made for AZ. We hope to visit Wendy and Randy in Coolidge before they return home December 11 and Jacquie and Jim in Quartszite in Jan/Feb. Also Lorrie Rendleman, one of our Salmon Arm neighbours, has invited us to look them up in Phoenix. We had a good visit in Port McNeill with John & Anne and Dennis & April (and kids Nikki and Travyn). On Saturday night Anne made her famous crab and smoked salmon fettuccini; amazingly delicious! We’d driven up to Port Hardy in the morning to buy the fresh crabs and smoked salmon from the shop that does the smoking. Decided to eat out at a little restaurant there called Malone’s and it was smorg only on Saturdays. Very nice selection. It’s a sad state when I can’t manage more than one plate though. We left McNeill Monday morning. The road was dry til south of Woss then drizzly. As we started down toward Menzies Bay, the skies opened up and the wind blew. South of Campbell River the weather made driving a bit of a challenge for a little way. We went into Miracle Beach for the night. We were able to get #23 which is the driest and brightest site when there are only the two rows open. 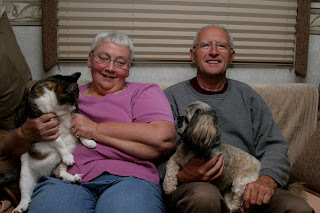 Aileen’s sister Pat and hubby Jim joined us for supper and a good visit in the trailer. We were serenaded with falling cones and the odd branch in the windstorm. Nothing serious at the trailer but there were a few trees and large branches down in the campground when we went for a long walk next morning. It was a pleasant sunny walk. 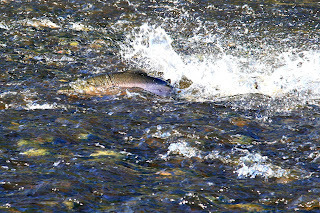 We watched some Coho salmon struggling through the shallows up Black Creek in the park. We spent Tuesday and Wednesday nights in Mom and Dad’s yard in Errington. Visited Mom and Dad in Stanford Place. They were feeling a little poorly, in fact, they were sleeping at 11 AM when we went in. They’d had a busy weekend. Mom’s sister Eleanor and husband Ron Pengelly had come down from Salmon Arm specially to see them. I think they had been in three days to visit. Dad had been very alert the day before we went in so needed a rest, I guess. We packed up in the pouring rain this morning and moved down to Riverside RV Park along the Cowichan River at Duncan. We got set up before having a late lunch since it wasn’t raining. We went for the full hookup to fully recharge before spending the next several days unplugged in Goldstream Park near Victoria. It was only $22 for full hookup here but cash only. You can supersize the pictures by clicking on them, use the back arrow to return to the post. If you'd like to comment on anything or just put your two bits worth in, just click on the comments at the bottom of the post and follow the directions. Be warned that others will have the opportunity to read your comments. If there is a number in front of the comments, ie. 1 comments, that means someone has added one. On Wednesday we had a leisurely start to our day then had sister Wendy (and Randy) stop by to visit. They brought some delicious tomatoes for us. When they departed Aileen and I visited my parents at Stanford Place in Parksville, their new home. Dad was quite bright and was mostly able to join in our conversation. Mom seems happier now and except for some yearning to return to their house (which is really impossible) was in good humour. She is fairly confused and forgetful. She has made a good friend across the hall. Florence is 97 and she and Mom are together much of the time. Apparently Mom does lots of weeding in the central courtyard but her request for a long handled hoe was turned down. After lunch we hooked up the trailer and made it all the way to Miracle Beach (about an hour’s drive) where we are staying the night. Aileen was tired so she had a 2 hour nap then we cooked buffalo burgers over a campfire. We went for a long walk around the perimeter of the campground before dark then early to bed. This morning we woke late and lazed around the trailer as it was raining well. We hadn’t unhooked yesterday so just put the jacks up and carried on this morning. We visited Aileen’s cousin Gloria and hubby Bill Van Bergen at Willow Point for a couple hours. I’d taken shots of their 50th anniversary party back in the summer when we made a quick trip down to attend it. Today I printed them a few pictures on my big printer which is traveling with us. I think Gloria was pleased. We left Gloria’s and made our way up to Port McNeill this afternoon driving through some very heavy rain. We had planned to sneak into Port McNeill so Aileen could have an early night but apparently, eagle eyed niece-in-law April spotted us and phoned Aileen’s sister Anne and said she’d seen an Arctic Fox trailer which must be us. So, a few minutes later Anne phoned to check. She and Aileen both agreed they were tired so put off visiting tonight. We are invited there for supper tomorrow night so can visit then. Amazingly, no rain since we set up tonight so far, although the forecast looks ugly. We decided to stay in the regional district park on the edge of town and have hook ups since heavy rain would make it tight for the solar panels to maintain the batteries.